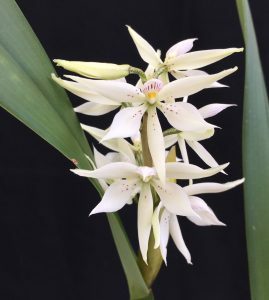 This is the first flowering for us of a delicate Prosthechea species native to Venezuela (as the name would suggest) as well as Colombia and Ecuador. It is reported to grow in wet lowlnd forests and so we are growing it in Warm Americas (Min 16C) at bench level where it will stay damper than plant hung high in the roof. The flowers are large for the size of the plant and produced in profusion and as usual for the genus are beautifully scented. We are hoping to set seed this week and add this to our species in flask. The plant is a little spreading in its growth habit and so we have the plant in a basket to allow it to develop into a relaxed specimen.